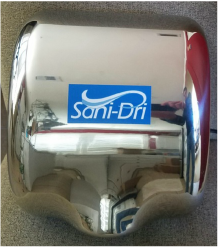 With High Speed Blowers that dry your hands quickly and efficiently, the Sani-Dri hand dryer also sanitizes your hands by using Ozone. The ozone hand dryer reduces or eliminates airborne pathogens and microbials. Placing your hands under the Sani-Dri automatically activates the high speed blowers. There are no buttons to press, repair or allow cross-contamination with surface contact. ​​​While your hands are being dried with the high powered streams of air, sanitizing ozone molecules are generated simultaneously. This leaves your hands not only dry but free from bacteria and pathogens.